Please click the link to access our 2018-19 Carers Progress Report outlining how we are performing with regards to developing our carers list and proving support for our known carers. There is a public car park nearby and our main entrance is designed for easy access by those who are disabled. There is also access to a disabled toilet. Please Note: The Surgery Reception desk is closed between 1pm and 2pm and the surgery will only accepts calls for urgent matters during this time. If you have an urgent need please ring the bell for assistance. If you have an appointment booked during this period please use the check in screen in the main foyer. Between 13:00pm and 14:00pm the main reception desk will be closed however need for urgent attention will be available. During this time the only accepts calls for urgent matters. 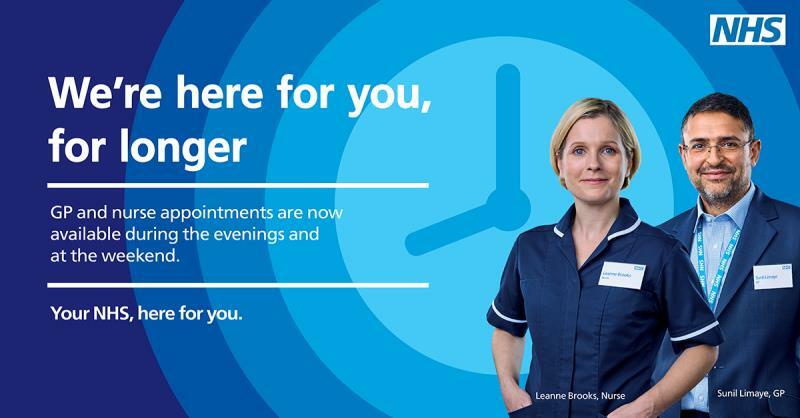 For more information regarding this new service please see - Improved Access section within the further reading tab or speak to a member of our reception team. I am very pleased to announce that Liz Buckland will be joining our Practice Nurse team week commencing the 11th of February 2019. Liz will join our clinical team working alongside our two practice nurses, Lyn and Kathryn as well as with our three GP partners, Dr Mallard-Smith, Dr Roberts and Dr Hodder. Elizabeth has previously worked as a Nurse within Bucks Healthcare Trust, specialising in INR management. The practice will be supporting Liz who will be working towards her Graduate Certificate in General Practice Nursing Certificate through Buckinghamshire New University. We are looking forward to Liz join our team here at John Hampden Surgery and look forward to our patients meeting her visits to the practice. Wednesday, 10 April 2019 @ 18.30 hrs.